Sketch + Fuzz: Limeligh Papercraft Blog. 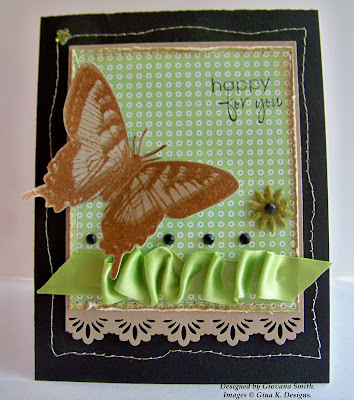 Color Challenge + Butterflies: Embellish Magazine. For my card I used Gina K new Digital paper "Double Dots", I stamped the butterfly in Kraft CS, I used 2 colors: Antique linen first and then Tea Dye, after that I added some Clear ep and heat embossed. I added some Green Lime Satin Ribbon and a fuzzy felt flower with a black rhinestone. The sentiment is from Botanicals. 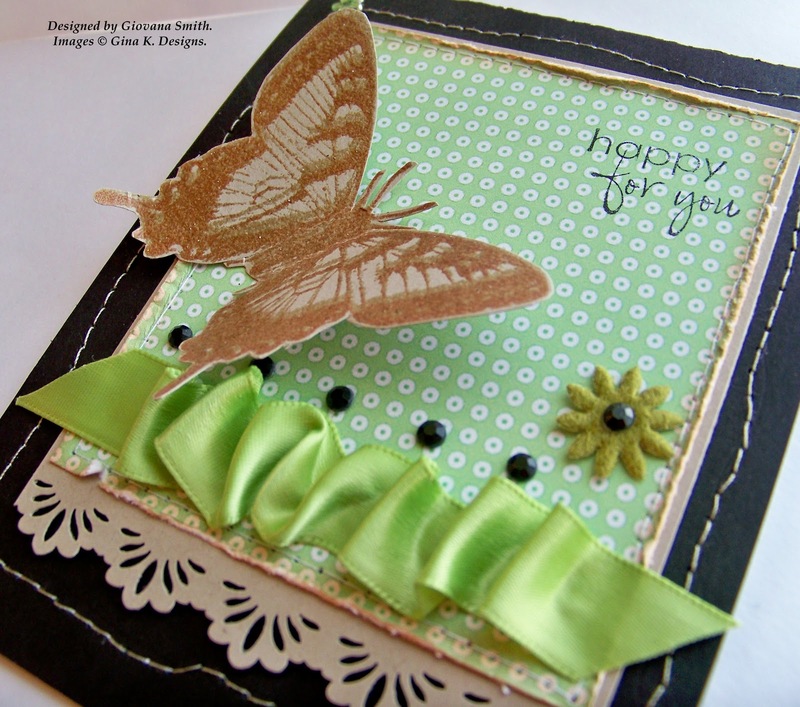 Embellishments: Green Lime Satin Ribbon (Offray), Felt Flower (SU), Black Rhinestones (KaiserCraft), Flower Rhinestone (Hero Art). 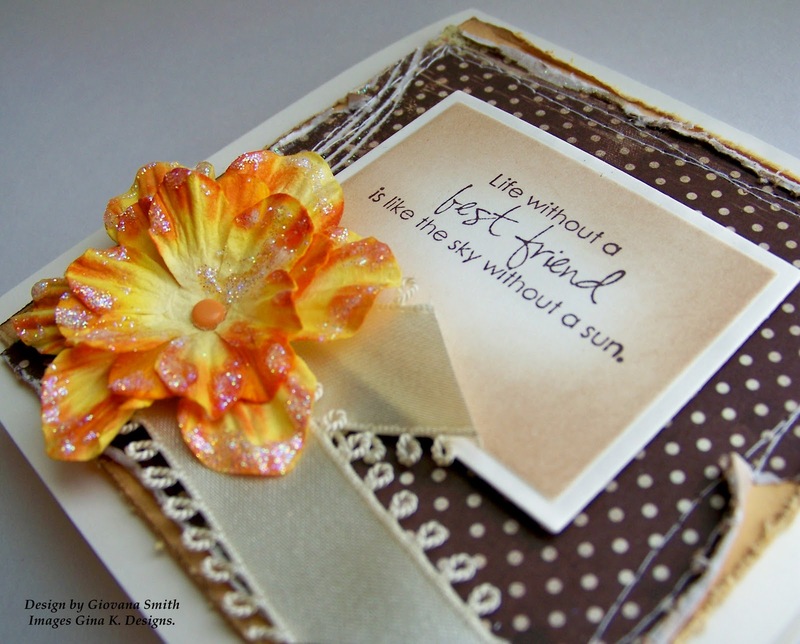 Accessories: Sunburst Border Punch (Kiskars), Sewing machine, daubers, Glue dots, embossing powder, embossing gun. PS: Thanks so much for all your sweet comments about my Great News. I am so excited I can't still believe it. Thanks again! Hello my friends, hope you all are enjoying your long weekend. 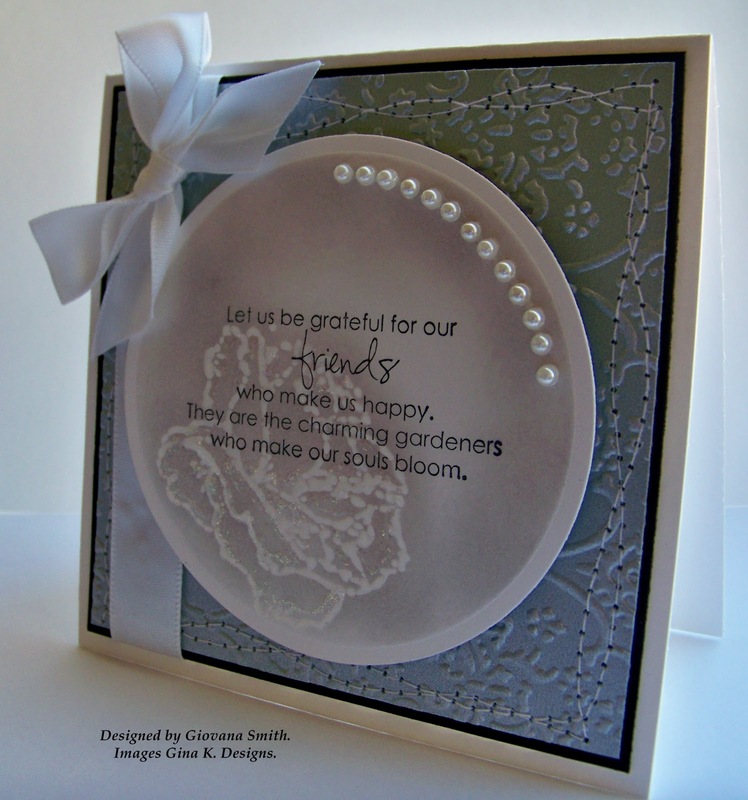 Usually I don't stamp on the weekends, but today I decided to have at least a couple of hours of therapy, LOL, so I made a card using the new set "Botanicals" from Gina K. I used the sketch from 2S4U and also added the Distress/Sponging Challenge from Stampin' Sisters in Christ. Details about my card: I started with a piece of Ivory CS. I matted, distressed and stitched a piece of Chocolate Brown and Innocent Pink CS. The BG image was stamped in Antique Linen and the flowers in Walnut Stain Distress Ink, then I sponged the borders with Tea Dye Distress Ink. After that I applied a couple of coats of UTEE for the shiny look. 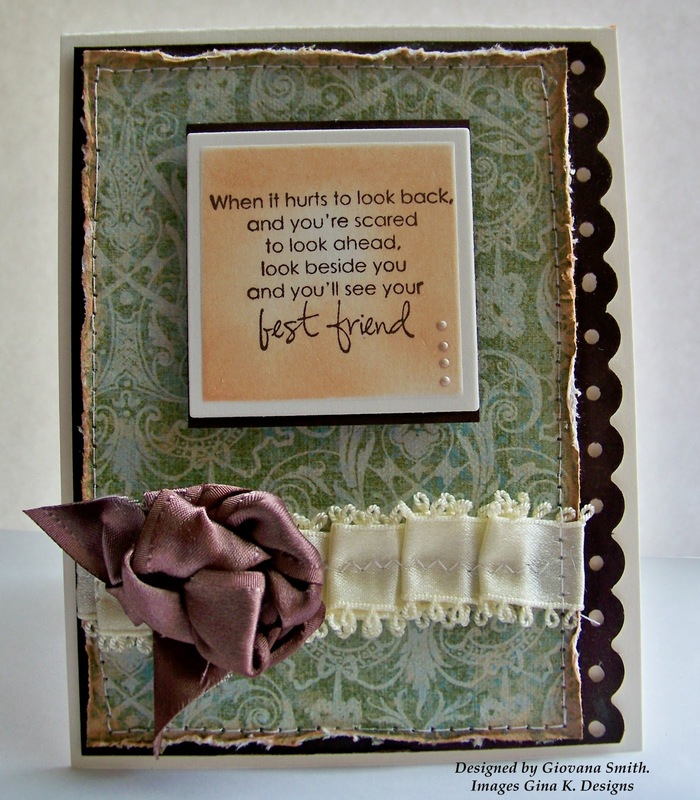 The sentiment was stamped as well in a piece of Ivory CS in Espresso Adirondack Ink. I adhered some Pink Satin Ribbon. Ink: Antique Linen, Tea Dye, Walnut Stain Distress (Ranger), Espresso Adirondack (Ranger). Accessories: Sewing machine, White thread, Daubers, UTTE, Embossing gun (Marvy Uchida), Foam Tape, Scor-tape. Hello my friends! 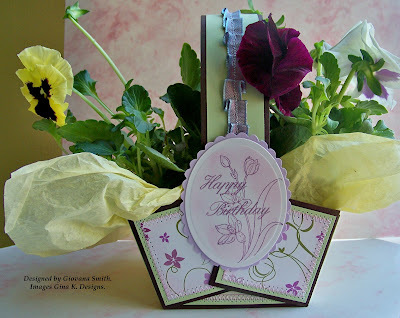 I have a card for you today using one of the new stamp sets from Gina K. released last night! This set is beautiful and is called "Botanicals" . 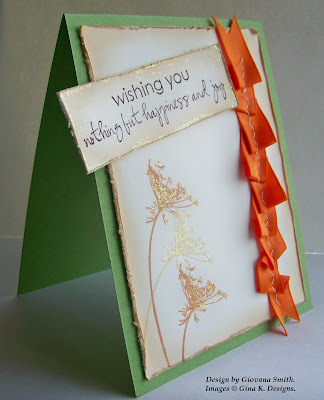 I started my card with a piece of new Gina K. CS Grass Green . 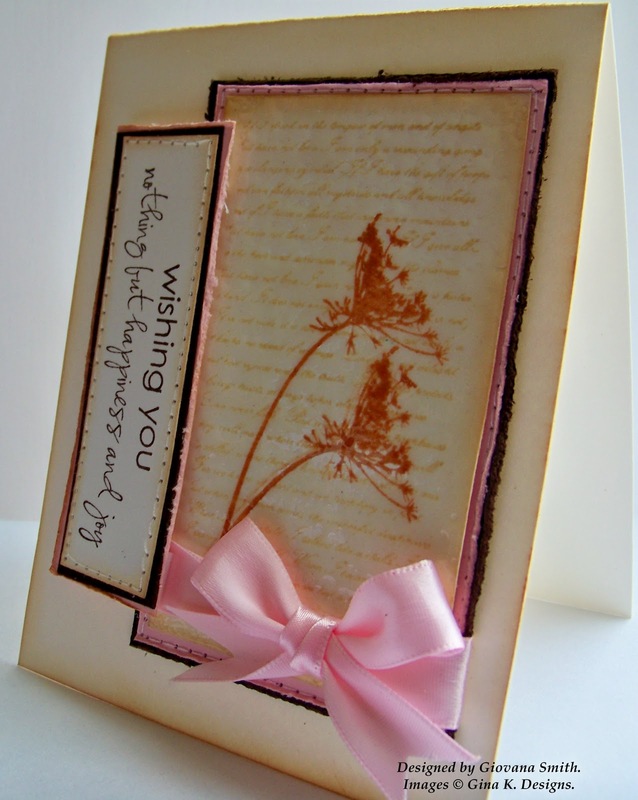 I stamped the dandelion 3 times in a piece of Ivory CS in 2 colors, I used Tea Dye and Antique Linen Distress Inks. I added a stripe of 1/8 Scor-Tapet the right side, then I took a piece of Orange Ribbon and folded to create an uneven wave, after that I added some zig zag stitches. After that, I distressed and sponged the borders. Finally I stamped the sentiment in a piece of Ivory CS in Espresso Adirondack Ink. As a little touch I added some Diamond Stickles. 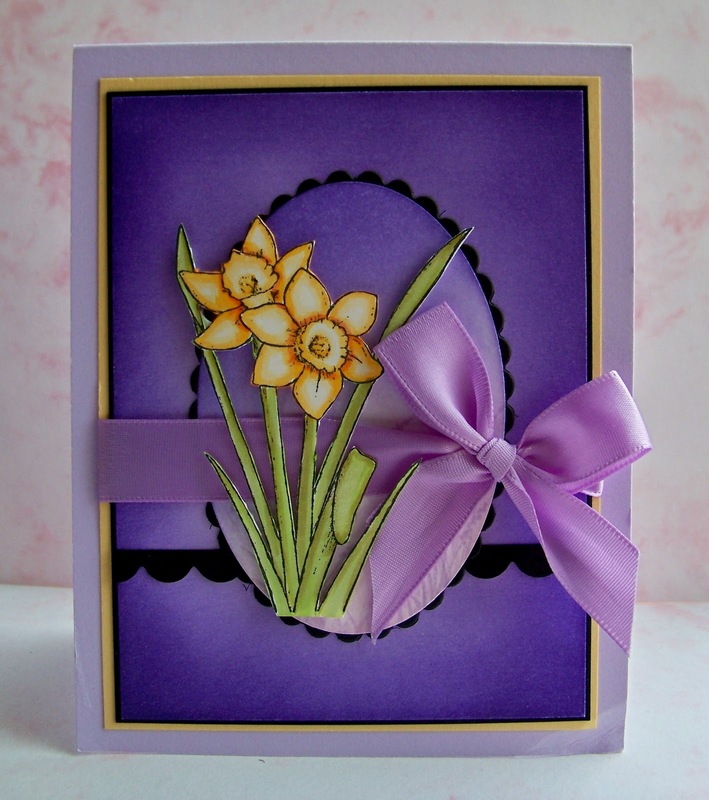 City Crafter Challenge: Recipe: 1 ribbon, 2 papers or CS, 3 flowers. Cas-tastic : A touch of Green. 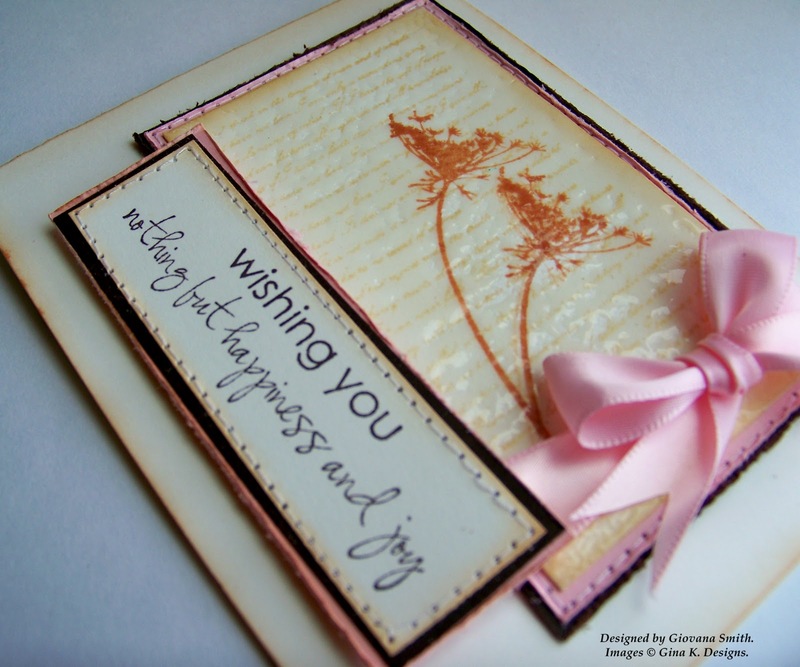 Stampin' Sisters in Christ : Distressing or Sponging. Card Stock: Grass Green, Ivory. Ink: Espresso Adirondack (Ranger), Tea Dye and Antique Linen Distress (Ranger). Accessories: Stamp-a-ma-jig, Sewing machine, White thread, Foam Tape, Scor-Tape. Good morning everyone! Even though here is gray and rainy, I have some great news that are making my day very shiny!! I made it into the Gallery Idol Top 20!! 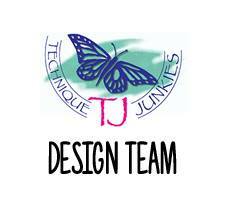 You can see all the 20 designers and her creations HERE. This is the card that put me in the Gallery Idol Top 20 !! Hello my friends, my Mojo is back!! LOL. I've been dealing with lack of creativity and I don't like those days. Today is a very easy day :) I have the day off and DD is volunteering at my friend's church, isn't she sweet? She is helping planting flowers. So I decided to let my creativity flows and it did indeed. I have 1 card for 4 challenges! The Shabby Tea Room: Polka Dots. 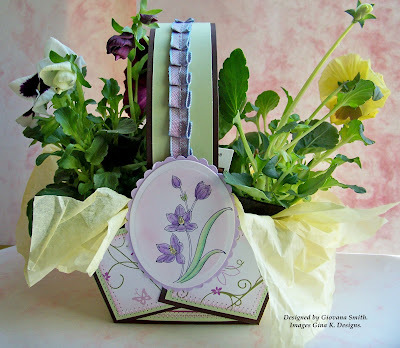 City Crafter: Recipe Challenge: 1 ribbon, 2 paper or CS, 3 flowers. Stampin' Sisters in Christ: Distressing. Stamp Something: 2 of Something. So, here are the details about my card. I started with a piece of Ivory CS. I matted and distressed a piece of Sweet corn and Chocolate Dots (Out & About Collection), then I stitched them. 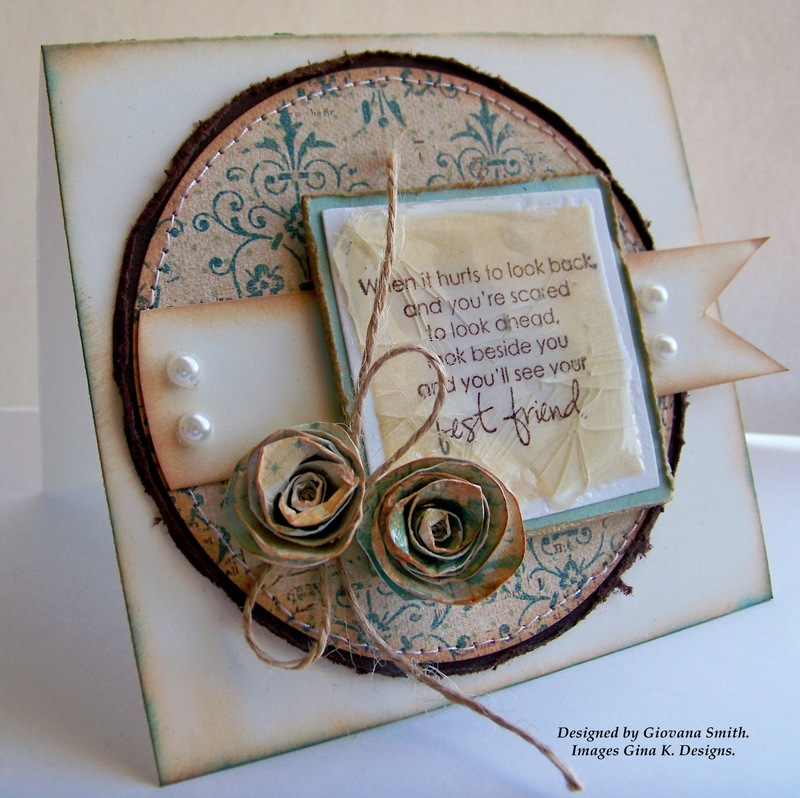 I stamped the sentiment from "Friends" set (Gina K) on a piece of Ivory, cut and emboss with Rectangle Nestabilities, then I sponged the inside borders. My favorite part is the flowers. I followed CeeCee Tutorial, super easy and fun! She used different flowers, but I tried it with Prima flowers, just be careful not to spray the flowers too much because it will lose its form and consistency. 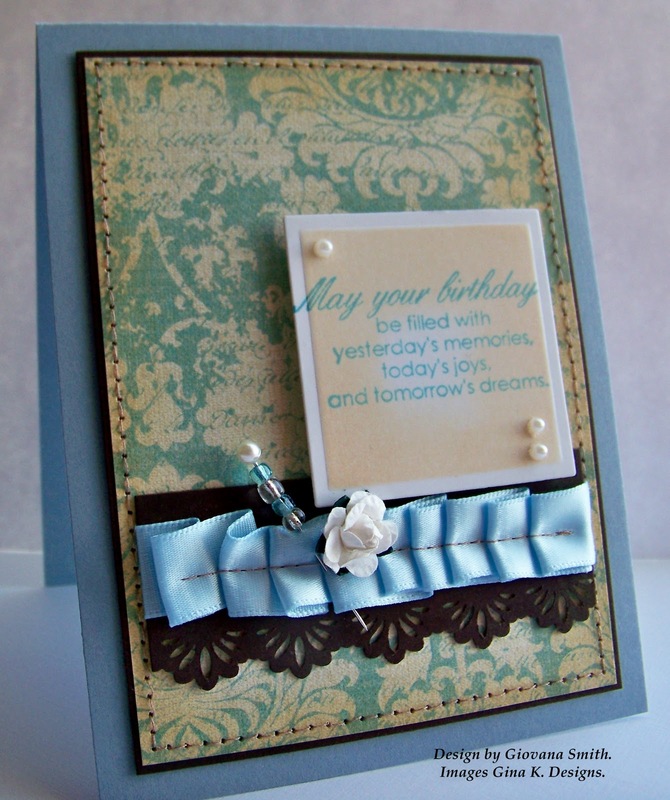 Finally I added ribbon behind the flower and adheres it to my card. 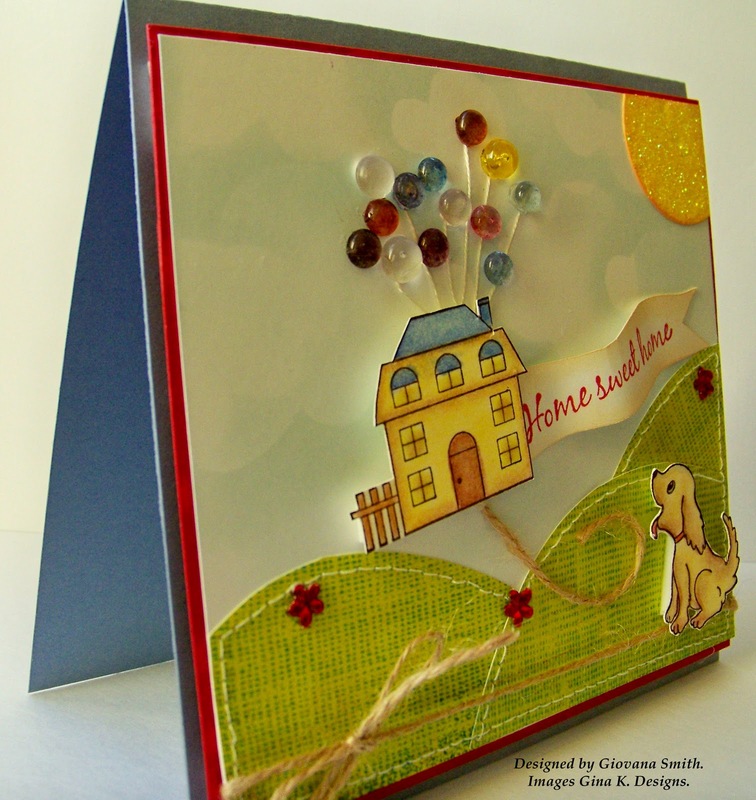 Final size card: 4 1/4 square. 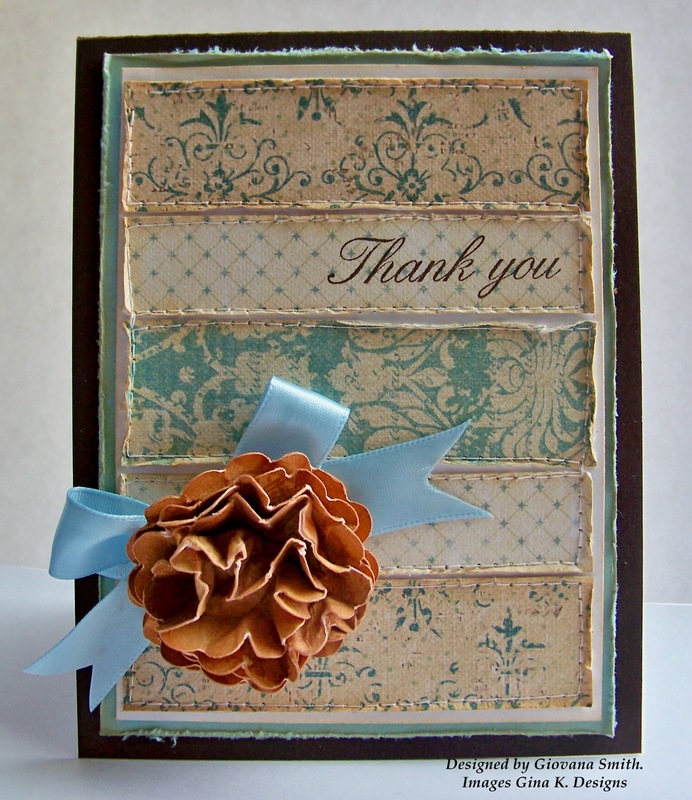 Embellishments: Mulberry paper Flowers (Prima), Brad, Ivory Ribbon (Offray). Hello my friends, I hope you all are having a great day. I don't have a card for you today, here has been a little bit crazy. First, we had a mouse in our house and I did freak out. I don't like those critters at all. Then my daughter started feeling sick, she is complaining her throat hurts, she can scream loud, so I don't think it is an infection, but just in case I need to keep an eye on her and I wasn't feeling too motivated to stamp or do anything. I am still working on my garden when the weather allows me to, but other than that I think the cloudy days are affecting my mojo. 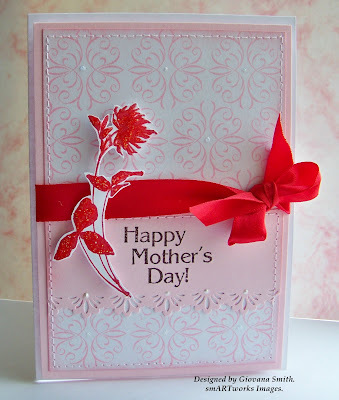 Anyways, yesterday I received a card from Theresa Momber, Yess!!!!! She does such a beautiful work. 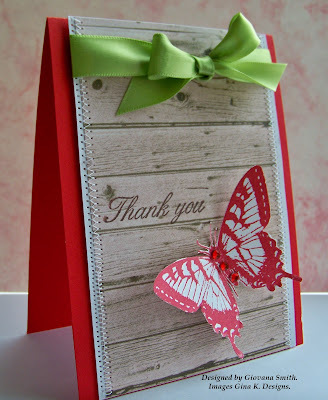 I got this card from a new thread on Stamp TV called " Send a card, Receive a Card", it is fun and I think it's always good to receive a beautiful handmade artwork. I hope I can get some stamping time tonight. Anyway, I combined 2 challenges in this card: sketch from CPS and Musical from Stampin' Sisters in Christ. 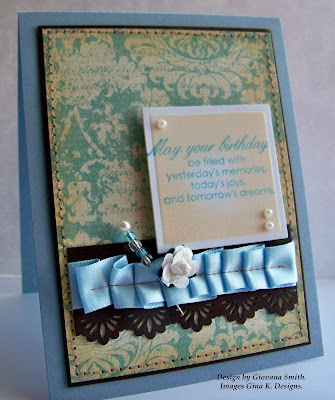 Embellishments: Twine (Gina K), Gold Rhinestones (Recollections). Accessories: Sewing machine, Daubers, Black ep, Embossing gun, Medium glue dots. Hello my friends and Happy Saturday. I am here praying for a good weather day, so I can spend some time in my garden. I have little lettuce sprouting :) and a lot of onions and garlic. Anyway, today I have for you a OLC. 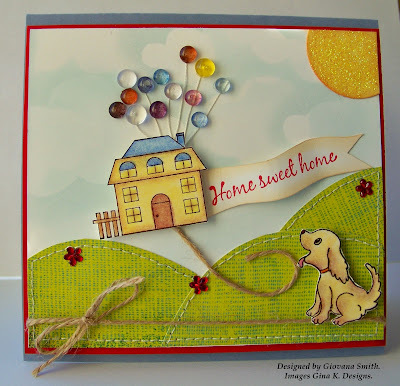 I usually don't make "One Layer Cards" because I love lots of layers, but it's always good to know you can embellish your card with ink and different stamps. 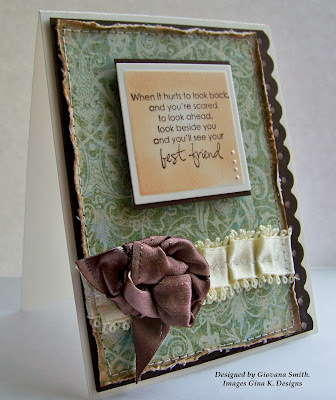 Also I got inspired by a new blog challenge CAS-tastic Challenges to create this card. 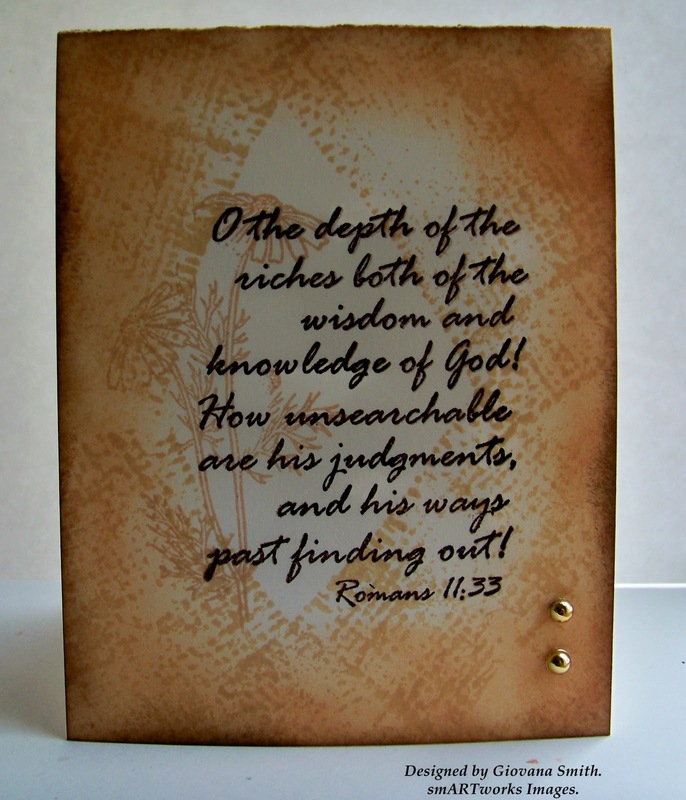 For my card I used this beautiful verse from "Ministry Mix" set. 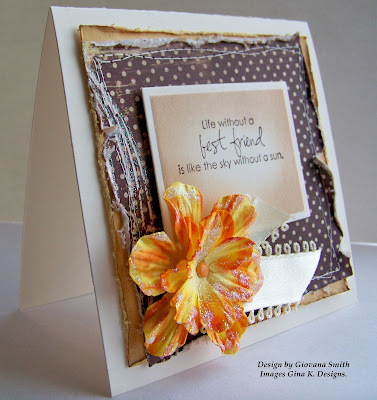 First I stamped the verse in Espresso Ink, then I stamped the flowers in Desert Sand (Memento). After that, I stamped the Weave BG in all corners and finally I sponged Tea Dye and Walnut Stain Distress Ink around. Final touch a couple of Gold Rhinestones. Hello my friends, I hope you are having a great day! Here in this part of WA state the weather is crazy!! WE are having very cold, windy and rainy days. I am really looking forward to those really nice bright and warm Springy days, oh well, I should keep praying for that. 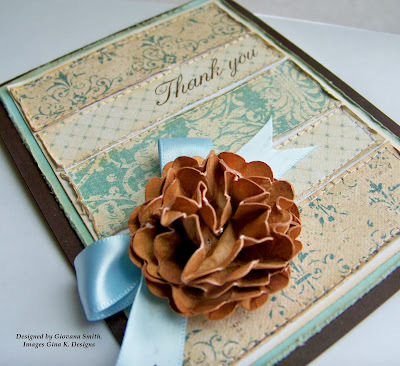 I have a Thank you card for you today. I used the sketch from "Everything but the Kitchen Sink" I love this!! Isn't this tittle amazing? I wish I could spend less time in the kitchen and more time crafting, LOL. Anyway, here is my take on the sketch. I went into a very Vintage look. I used scraps of PP I had in the plastic container (I am a keeper of pretty paper, even if they are small pieces) ans sponged all the borders, then distressed them. After that I put all the pieces on a White piece of CS and added some stitches. After that, I distressed them a little bit more. I stamped the sentiment in Espresso Ink and matted this piece in a piece of Ocean Mist CS. After that I adhered to my card (Chocolate Brown). I made a paper flower and a bow in Light Blue Color. Card Stock: Chocolate Brown, Ocean Mist (Gina K), White (GP). Ink: Espresso Adirondack (Ranger), Tea Dye Distress (Ranger). 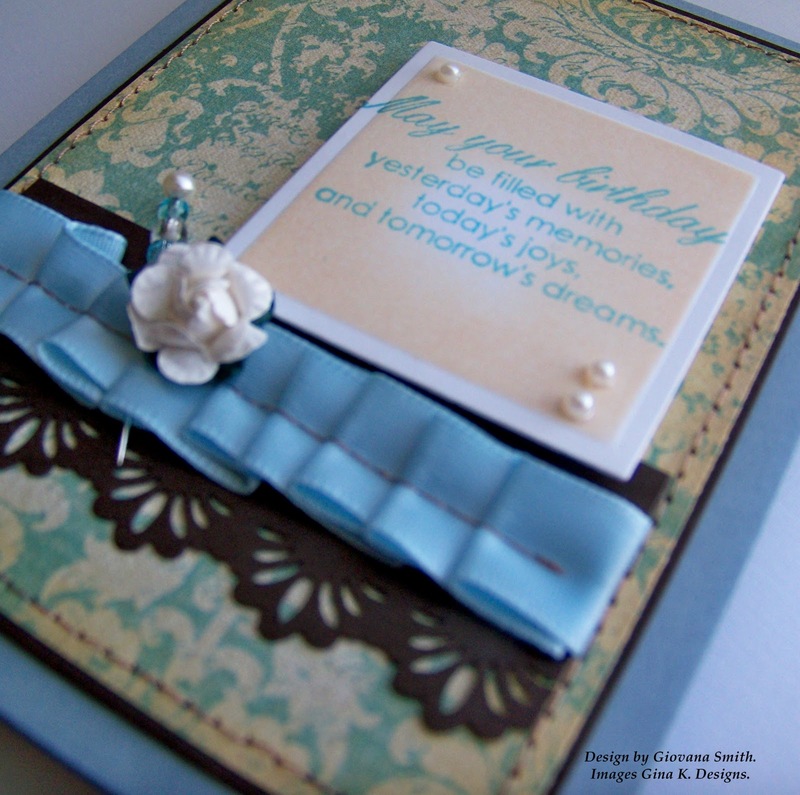 Embellishments: Light Blue Satin Ribbon (Offray), Silver brad (Jo Ann's). Accessories: Sewing machine, Mini glue dots, Scallop Punch (Fiskars), daubers. Hello my friends. Hope you are having a great day! Here has been rainy and rainy and... Rainy!! We are having a really weird Spring season, the temperatures are below normal and it is cold! I am praying for a better, mild weather. For the first time, since we moved into this town we are having a garden! I suppose the rain helps, but too much rain and cold temperatures... hmm maybe not. So, that's why I am spending a little more time stamping. I created this pretty card for two challenges. 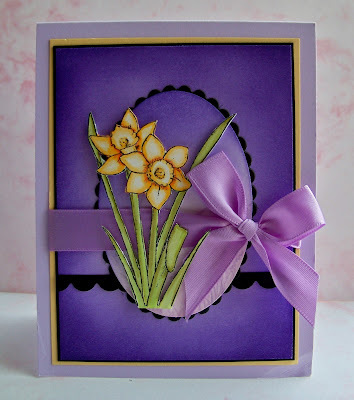 Sketch comes from Card Patterns and also I am submitting this card into the Celebrate Something Challenge over at Stamp Something. 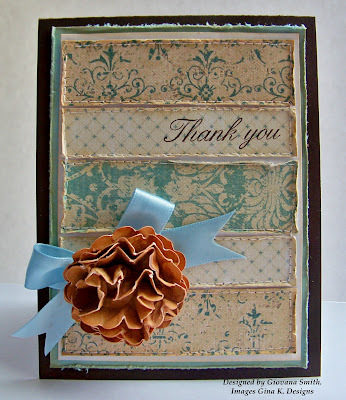 Details about my card: I started my card with a piece of PL Ivory CS. I matted a piece of Chocolate Brown with a piece of PP from K&Company (Ancestry.com Collection). 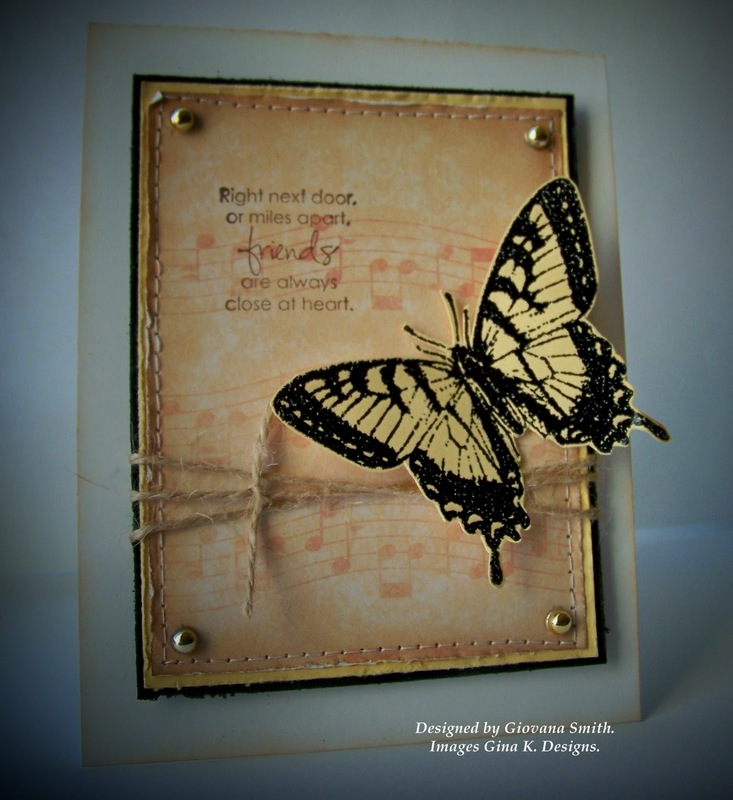 I sponged the borders of the PP with Tea Dye Distress Ink, also distressed, then I punch the right side of the Chocolate Brown CS using the Threading Water Border Punch. After that I added some straight stitches around. Then I added some Cream Satin Ribbon and the Chocolate Chip Ribbon Flower (handmade by me). It is super easy to make. 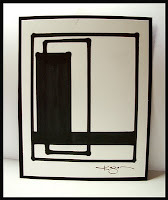 The sentiment was stamped in a piece of Ivory in Espresso Ink, then cut out and embossed with Square Nestabilities. Accessories: Sewing machine, white thread, Threading Water Punch Border (Fiskars), Square Nestabilities, Daubers, Foam Tape, Fabri-Tac Adhesive. Hello ladies, I am here waiting for some sunshine so I can take a picture of my card. I made a couple yesterday and I love them!! and I hope you too, but while I am waiting for the sun I just want to share few things. If you have notice I am close to 100 followers!! Thanks so much, so far I have 98 :) I remember when I started this blog the only one who read it was me, LOL, and now knowing some people read it and check it and leave comments, makes me very happy. Also I am getting close to 50,000 visitors!!! Woo-Hoo. 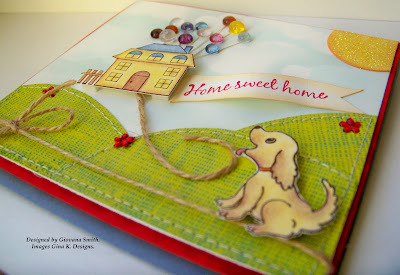 I don't know if you check CARDS Blog, but my "home Sweet Home" card was featured there, that makes me happy. 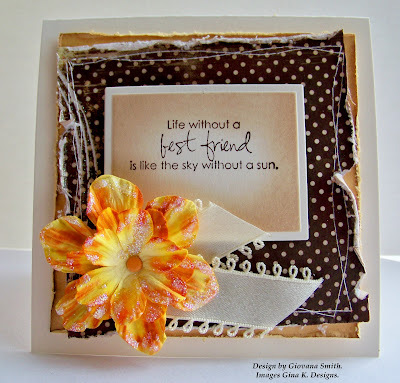 Also I got the Shining Star for my "Best Friend" over at Stampin' Sisters in Christ Blog. Some prayer request. I have an aunt who is battling Breast Cancer and a Brain Tumor, please if you could pray for her, it will be appreciate it. Thanks so much for stopping by, I will post my card as soon as I get good light. 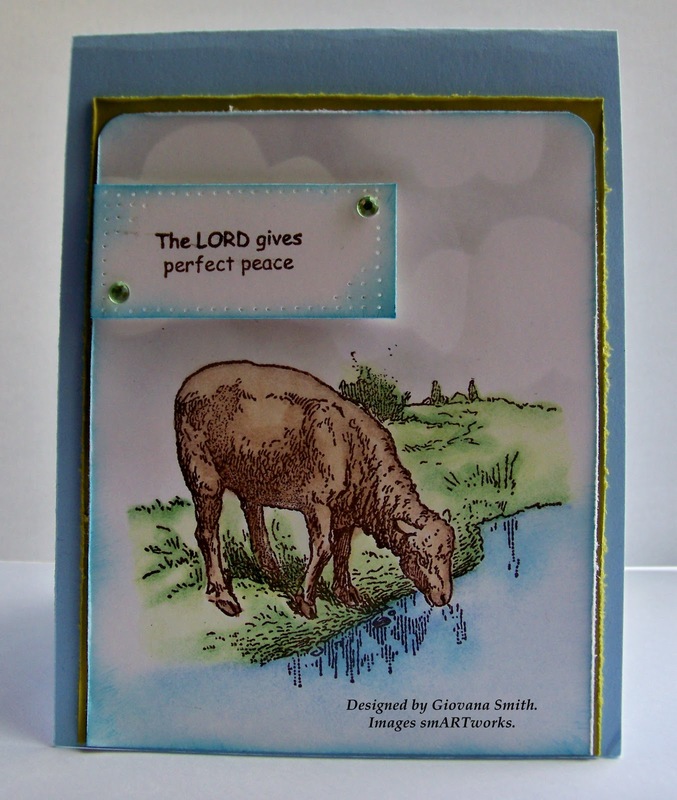 The Lord gives perfect peace. 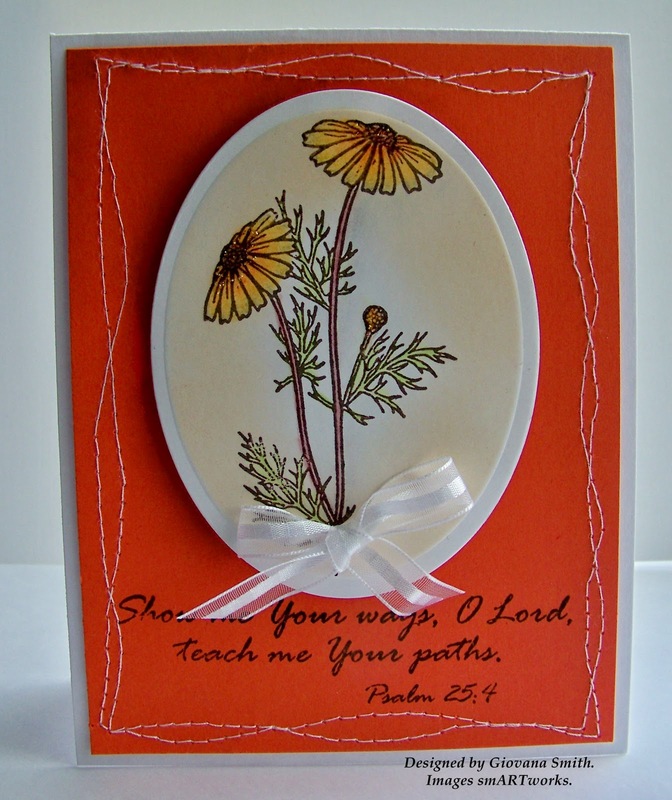 Today, I have another card using images from Ministry Mix Set by smARTworks. It is very simple, the colors are very peaceful and the image is one of my favorites. I colored it with Prismacolor Pencils and blended it with OMS. 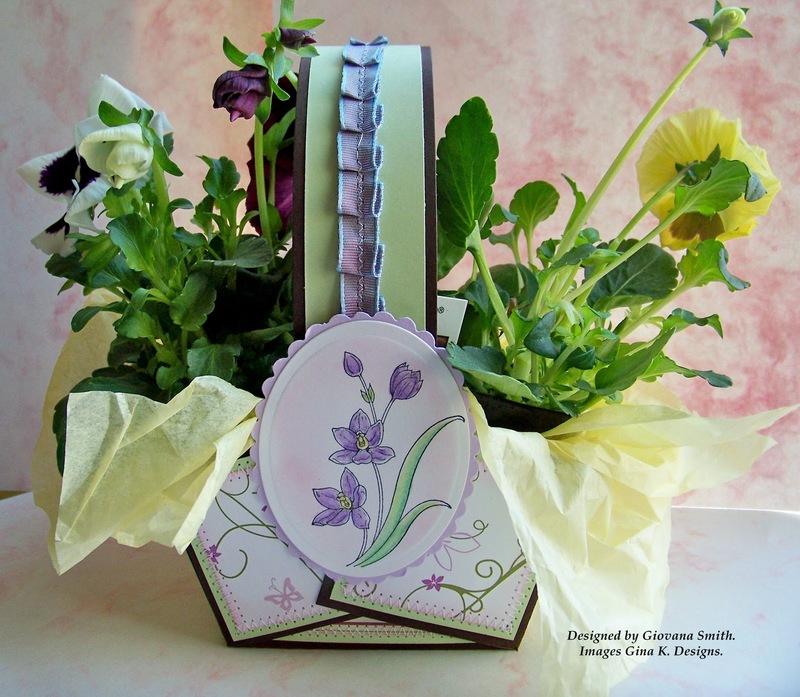 Accessories: Corner Punch (SU), Paper piecing set, Foam Tape, Prismacolor Pencils, OMS. Hello my blogger friends! Hope you are having a great day/night! Today I was feeling pretty good and because I didn't have to work I decided to do a major and intense cleaning house work, LOL. I did dust, vacuum, mop and shampoo the whole house. I planned to do everything in 2 hours, yeah probably you are saying no way, and you are right, I finished in 5 hours, after that I was exhausted, but my house is clean and I am happy (and tired too). 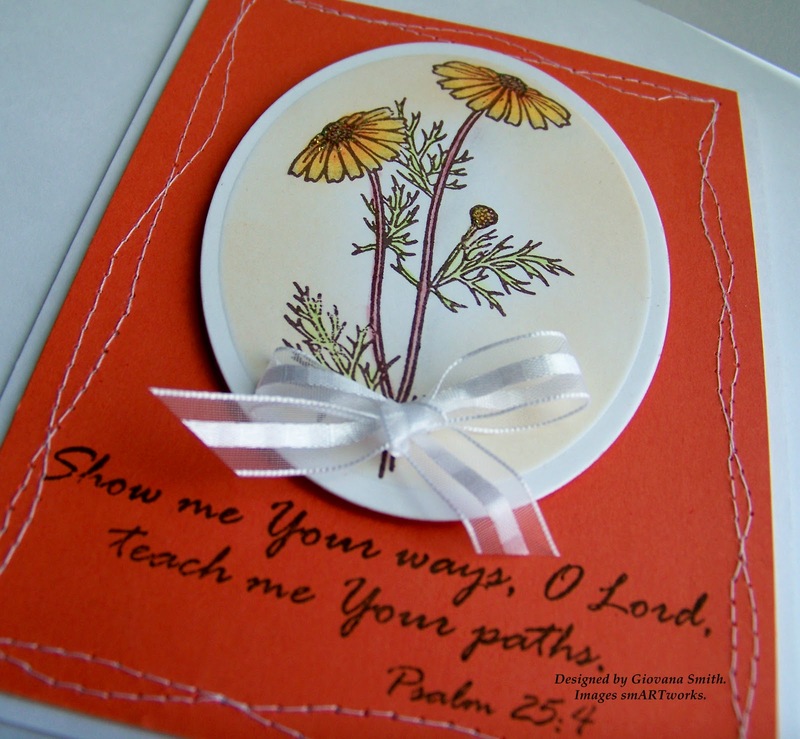 So, I took my Ministry Mix Set by smARTworks and created a card. Here the details: I stamped the flowers on a piece of White CS in Espresso Ink. I colored the image with Prismacolor Pencils, cut it and embossed it with Oval Nestabilities. I sponged it inside with Lien Dye Distress Ink. I cut a piece of Tangerine Tango and stitched it around, then I stamped the sentiment and adhere the Oval piece with some Foam Tape. 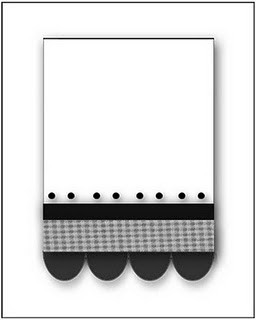 Embellishments: Sheer Stripe White Ribbon, Stickles. Accessories: Oval Nestabilities, Dauber, Sewing machine, Mini glue dots, Foam Tape. 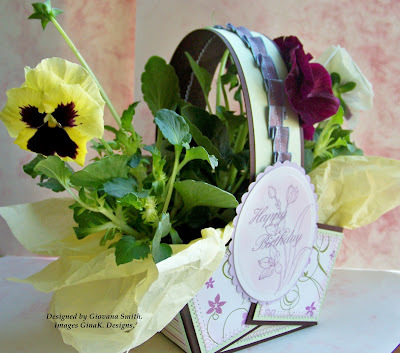 Also I want to remind you about the smART-word Challenge, this month's word is FLOWERS, so submit your flower cards to the challenge, and you can be a lucky winner. Remember, you don't need to use smART-works stamps. Have a happy and blessed day/ night. Hello my friends! I hope you are having a great Saturday. I am having a busy day today, in the morning we have some Community activities with a parade, games and fun for kids and families, then my husband and I are going to work in our garden, yesterday we got some fertilize soil, the only problem is that the truck has ruined part of my entrance grass, arggg, now I have to fix that too. Anyway, I am having so much fun with my "Friends" set that I have created another card. I wanted this card to be White, Black and Gray, but for one (or more) reason I was not too happy with the results, so I decided to add some color, first I tried Red but it was OK, then I tried Orange and I say BOOM!! orange it is!! 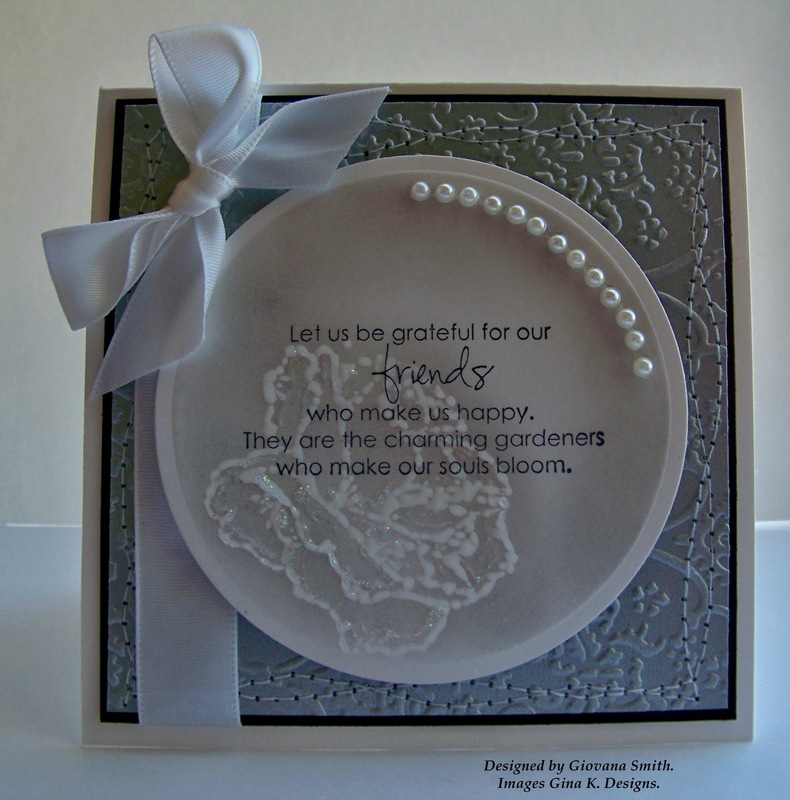 My base card is Silver Metallic, I cut a couple of Circles with my Nestabilities, they were embossed as well, in the smaller circle I stamped the sentiment in Black. 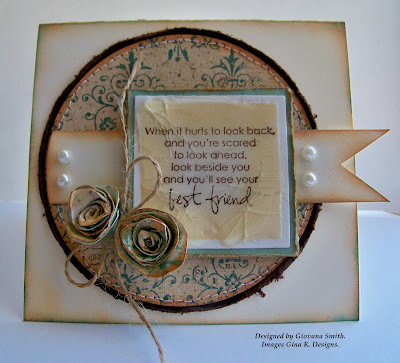 I added both circles onto my card using Foam Tape for more dimension. Then I added the ribbon, it was stapled direct to the CS, some pearls and finally I cut some leaves with my Cricut machine and Stretch your Imagination cartridge. Finished card size : 4 1/4 square. Embellishments: Pearls (Michael's). 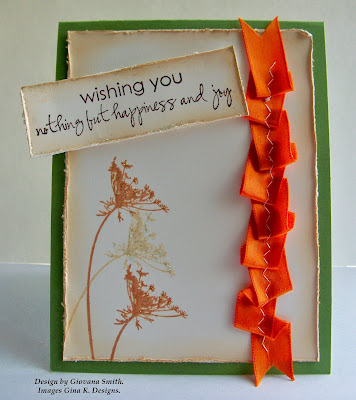 Orange Satin Ribbon (Offray), Orange Stickles. 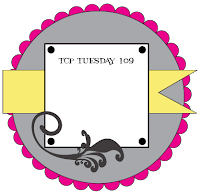 Accessories: Staples, daubers, Circle Nestabilities, Foam Tape, Cricut, Stretch your Imagination cartridge. Hello my friends, I hope you are having a great day. 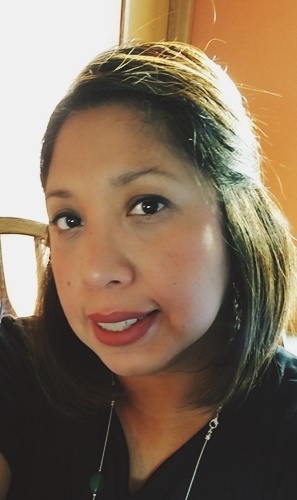 I am getting ready to head to the doctor's office and I hope everything is Ok with me, please if you pray, keep me in your prayers. Anyway, in the last Gina K. release I purchased "Friends set" and love it, hard to believe I just started using it. 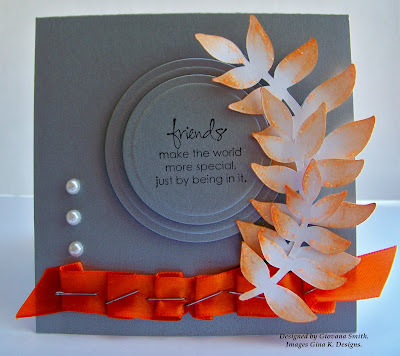 I created this card for Color Challenge over at Stamp TV; this week colors are : White, Black and Gray. 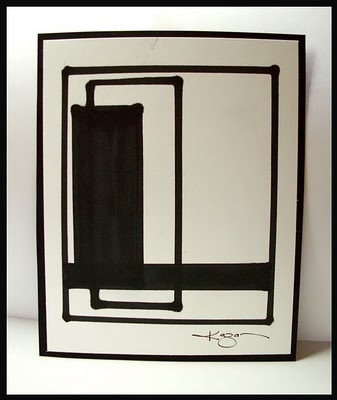 My card is a 4 1/4 square, I matted the black piece with Silver Metallic CS. I cuttlebugged the silver piece, then I added some stitches. 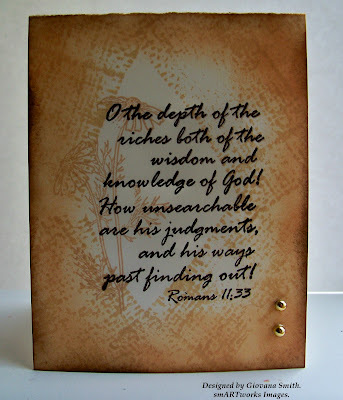 The saying part was cut with Circles Nestabilities, stamped in Stazon Black, then I stamped the rose using Versamark Ink and UTT, after that I sponged the inside with Weathered Wood Distress Ink. I added some Clear Stickles around the rose borders and some tiny pearls. Accessories: Sewing machine, Cuttlebug, Textile embossing folder, dauber, UTT, Embossing gun, foam tape, Scor-tape. Anyway, today I have a very Vintage card. I played 3 challenges together. 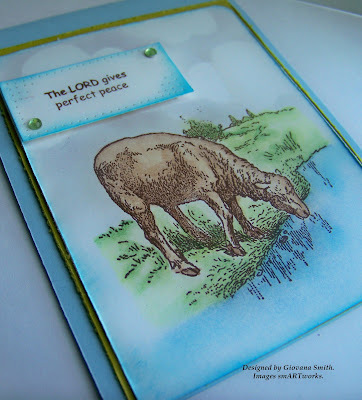 The sketch comes from TCP, the colors from Stampin' Sisters in Christ: shades of Whites, Brown and Blue and the Friday Blast from the Past "Cracked Glass Technique" over at Stamp TV. Few things to highlight, I made the paper flowers from some scraps I had left form my previous card, I sponged the borders after they were made and added some Diamond Glaze for some shiny look. 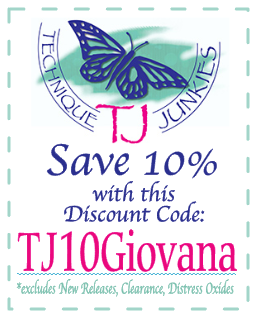 For the Cracked Glass I used UTT, I have to say it works 100% much better than Clear embossing powder, it's a little more expensive than EP, but if you use a coupon you can save a lot. Ink: Memento Rich Cocoa (Tsukineko), Tea Dye Distress (Ranger), Broken China Distress (Ranger). Accessories: Circle Nestabilities, Square Nestabilities, UTT, Embossing gun, Sewing machine, white thread, Medium Glue Dots, daubers, Foam Tape. 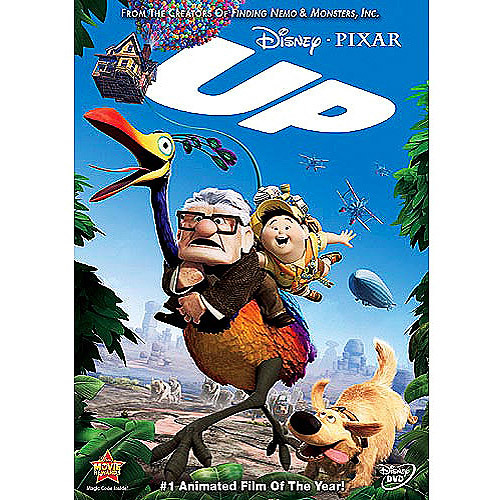 Favorite Movie: Inspired by UP! Hello my friends, Hope you are having a wonderful day. 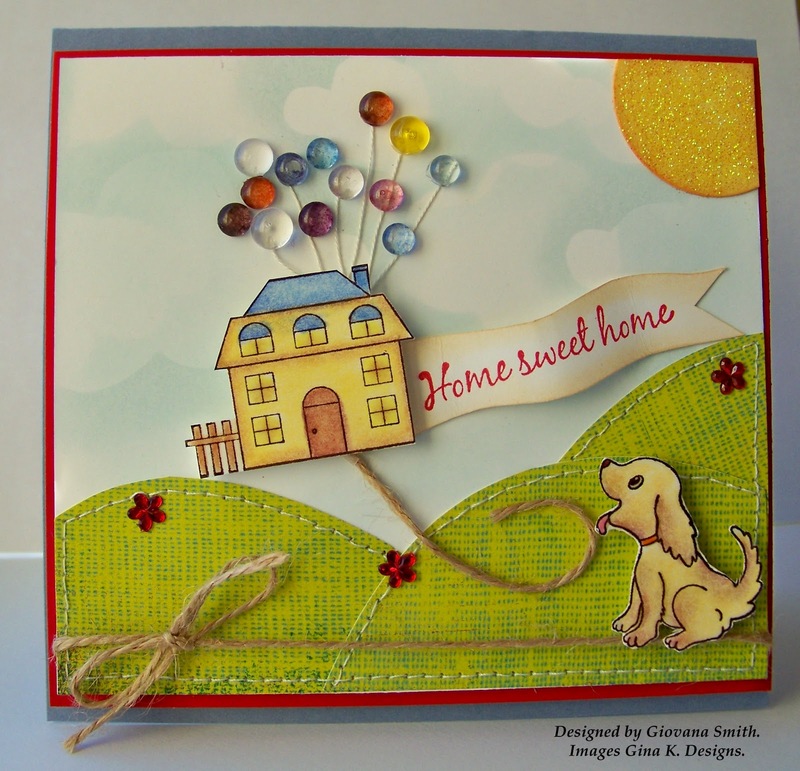 Gina K is looking for a new Guest designer, and this month's challenge is to create a card inspired by a movie. Well, lately the only movies I watch are Kids movies, my daughter is a movie fan, and she watches a movie and memorizes it. One of the latest movies we've been watching (more than 50 times) is UP! We love the whole movie especially when the Carl and Ellie (when they are kids) are talking about Paradise Falls and she says it is in "South America, it's like America, but South" I think that is my favorite line :) maybe because I am from South America, sadly I've never been in Venezuela. Anyway, I got this movie as my inspiration and I used Rupa's new set "Welcome Home"
I have to confess I had a lot of fun creating this card!! Accessories: Sewing machine, white thread, Diamond Glaze, DMC floss, Foam tape, Scor-tape, Circle Nestabilities, daubers, Prismacolor Pencils, OMS. For today I have a Birthday card to share with you. This is a 3 in 1 card. I used the sketch from CPS, the colors from Stampin' Sisters in Christ and the theme comes from Stamp Something. Here are the details of my card. I started my card with a piece of Bordering Blue, I matted a piece of Chocolate (Gina K) with a piece of PP (Ancestry.com Mat Pad) from K&Company. I added some straight stitches. 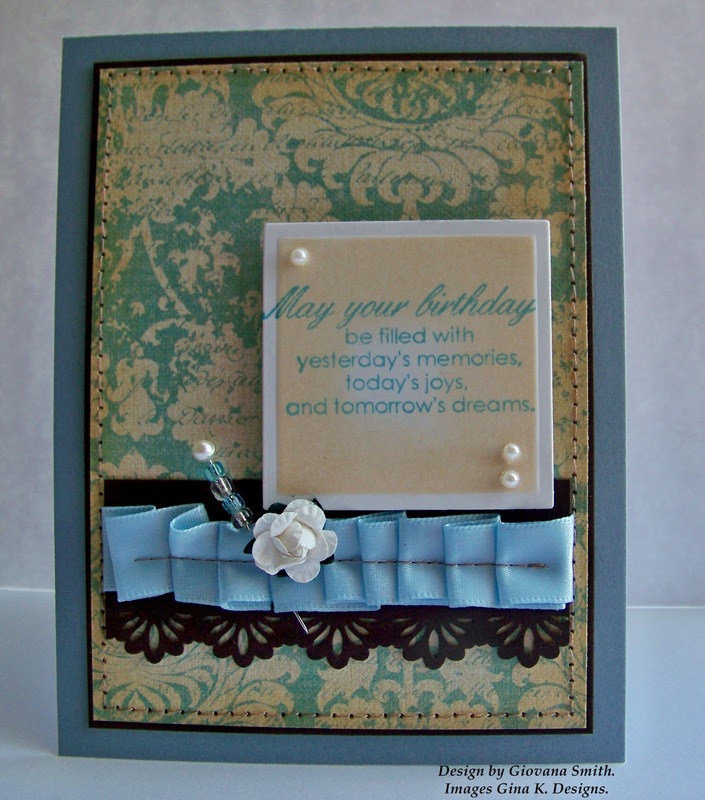 I cut a piece of Chocolate CS and added some Satin Blue Ribbon (ruffled with stitches), I used my border punch "Sunburst"
I used a pin and added some beads in clear and light blue, I think the pin add a little Vintage look to the card. 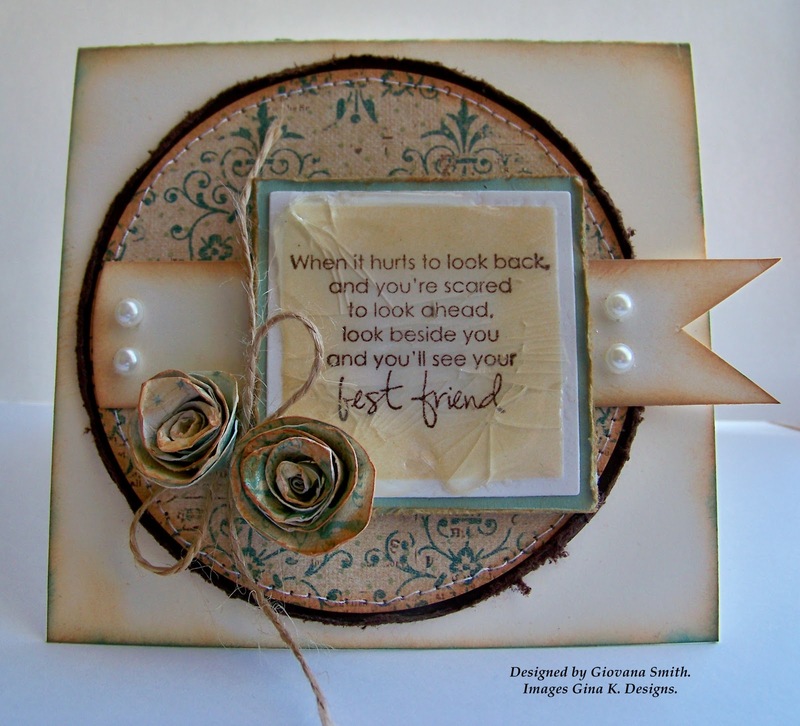 The sentiment is from Inside & Out (Gina K) and it was stamped in Broken China Distress Ink. I sponged the inside in Antique Linen Distress Ink. Accessories: Sewing machine, Brown thread, Square nestabilities, Daubers, Sunburst Border Punch (Fiskars), Foam Tape, Scor-Tape. Hello ladies, I am back from having some good time with my family and I have the names of the 2 lucky winners! Winner of the Oh Baby Set : Theresa Pollack. Winner of the Bag of Gina K. Products: Kathy H.
Ladies, send me your contact info to: giovanachavez AT msn DOT com. Thanks so much to all of you who played the challenge. Hello my friends. I hope all of you are having a great day!! Right now, my husband and daughter are making breakfast for me and they just told me not to go to the kitchen because they have a surprise for me :) All of these makes me happy. 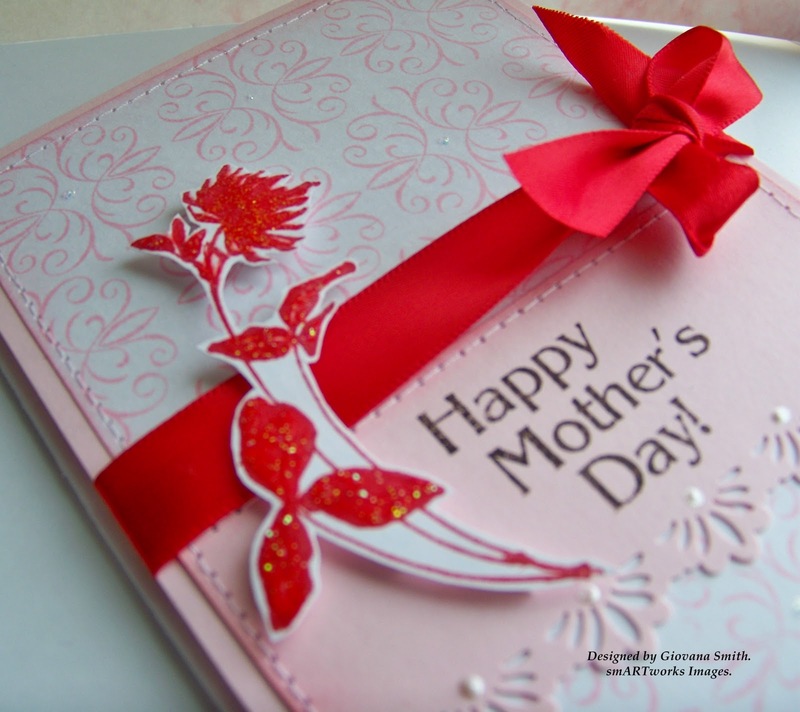 Last Friday I spent 3 or so hours with a friend from church making card for all the moms to our church, we had a great time stamping, talking and laughing, sadly I didn't take any pictures of the cards, i will try to take some today. 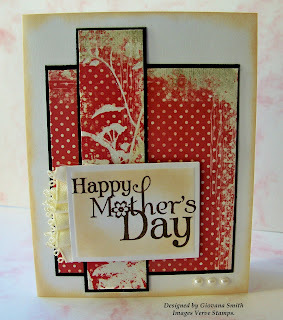 Yesterday I made a Mother's Day Card using the sketch from Mojo Monday (on Saturday). Accessories: Scor-Tape, Rectangle Nestabilities, Daubers, Foam Tape. I wish all of you a wonderful day, enjoy time with your family! Hello again, hope you all are having a great day! 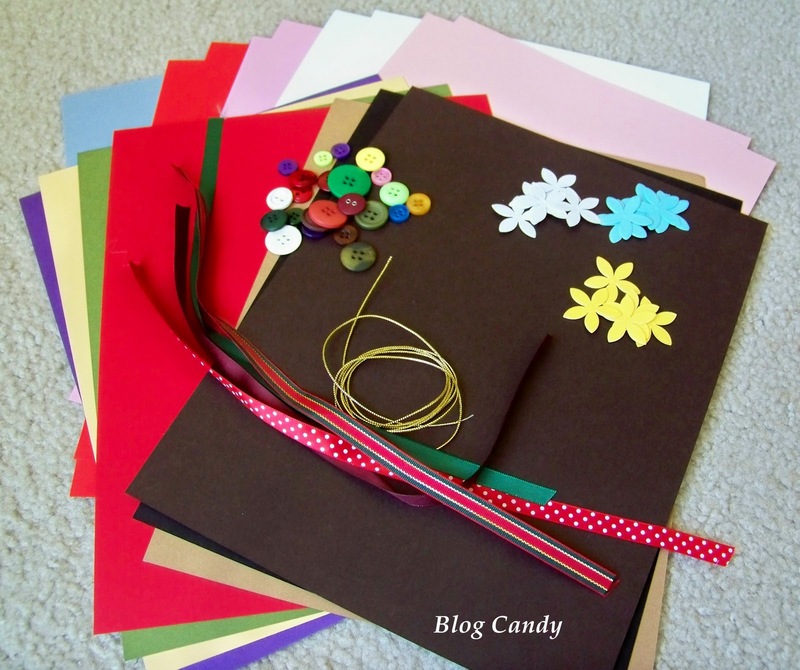 Now, it is time for Blog Candy!! 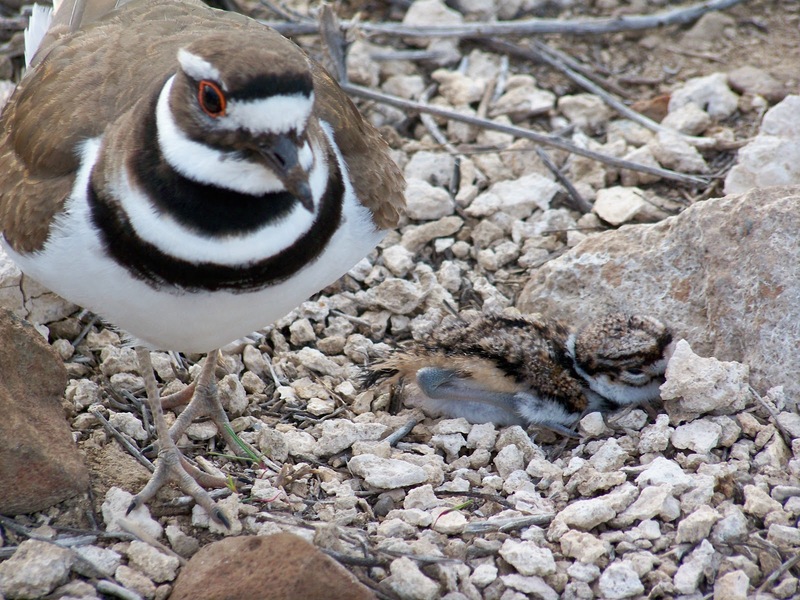 I have chosen Mother's Day for the deadline for this. 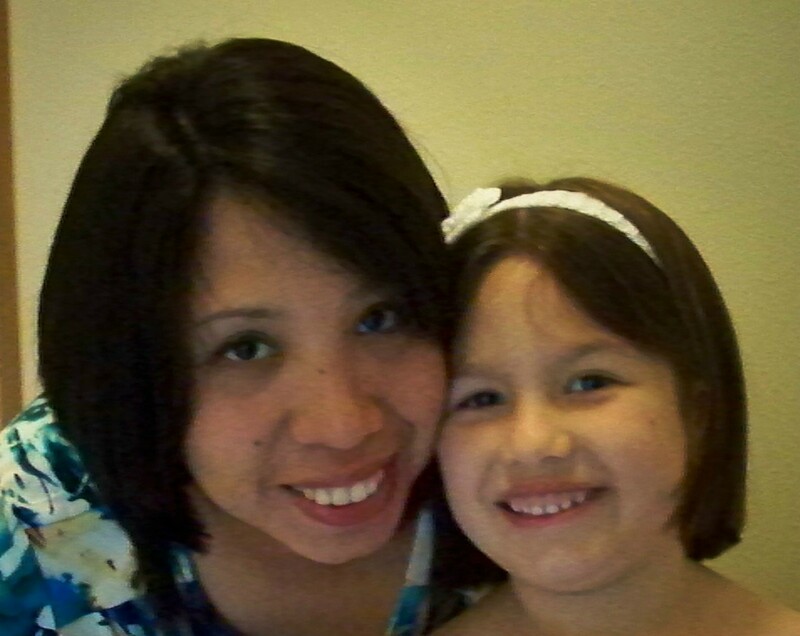 I am a mom of a precious, talkative and crazy girl, she loves to craft with me and her designs are awesome, LOL. I know moms are very especial and important in our lives. Mine died when I was only 13 and I miss her every day. She was very especial, crafty 100% and very funny. Her laugh made you laugh even if you were sad, she always made you feel happy and welcome. She loved to talk :) (I think Becca got that from grandma Oliden ) especially on the phone. Even though she died almost 24 years ago I can hear her voice, laugh and I remember her and wish she could be here to see her grand kids (10 total) and all her siblings happily married. The winner from the challenge will win "Oh Baby" Set from Gina K.
Prize #1: For a lucky commenter. Deadline: May 8th, 2010 - 12:00 Pacific Time. 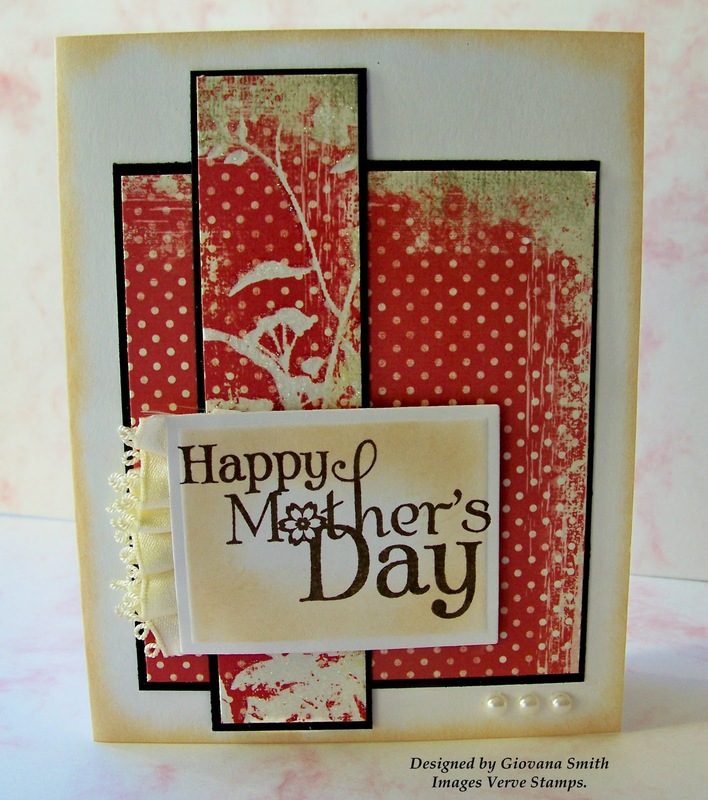 I will post the winner on Mother's Day May 9th. Hope you can have fun with this. PS: Nobody wants to win these? Hello my friends! I can't believe it has been more than a week since my last stamping creation. What can I tell you, I have been super busy (as always). Last weekend I had a garage sale, even though I didn't have too many people coming I sold quite a bit. The weather didn't help much, it has been horribly windy, we have had in the last 2 days hail, freezing rain and cold cold temperatures. I got a lot of flowers and some that I planted have died, ahhh so frustrating. Anyway, today I was finally able to stamp and it feels soooo good! I watched the new tutorial on Stamp TV and I couldn't resist myself and have to try the Basket. Ink: Black Stazon (Tsukineko), Memento Sweet Plum. Accessories: Sewing machine, White thread, Score-Tape, Scallop scissors, Yellow Tissue Paper, PrismaColors, OMS. Today we are starting a new month! Wow, May already!! and also time for another smART-word at smART-word challenge. This month's word is "Flowers", so just create something that includes flowers in your project "words, images, embellishments,etc" and link your project HERE. You can use any stamps you own, but if you play with smARTworks stamps you automatically will win one smART-buck. 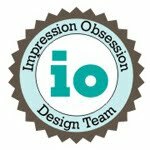 Here is the project I created for this month's challenge. 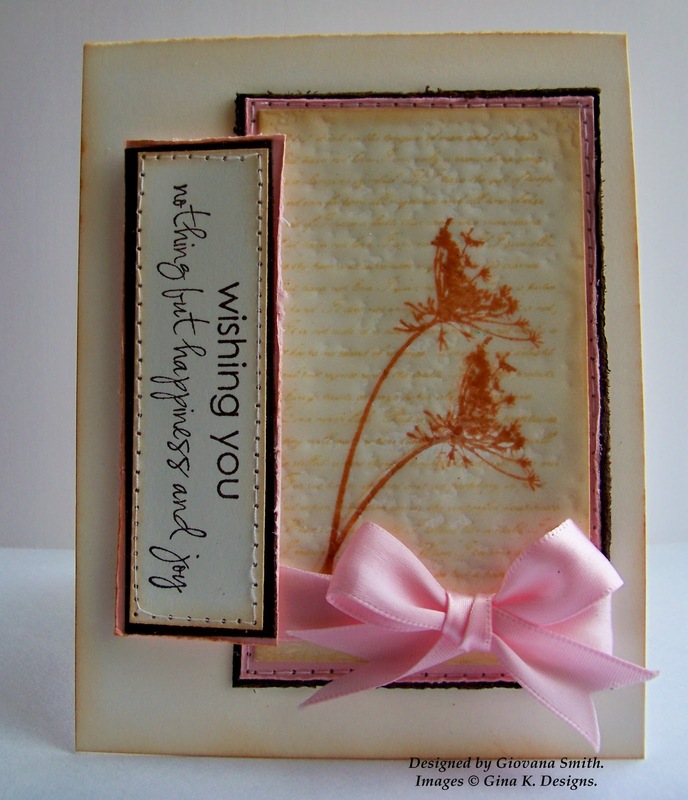 For my card I created the Background using one of the images from Frames set, I stamped it using Pretty in Pink Ink (easy way to get a good BG is using the stamp-a-ma jig). 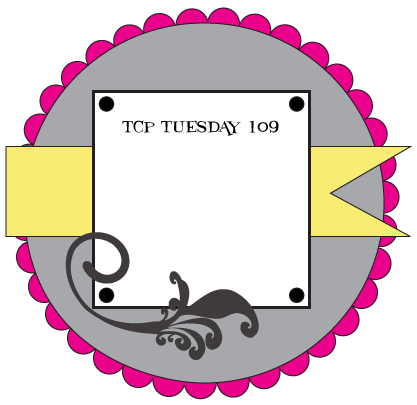 Then I stamp the pretty flower from Cookie Plate #1: Botanicals. I stamped the image in Real Red Ink and then cut it out. Finally I used the sentiment from Basket Set (This set is only $2.00!!) 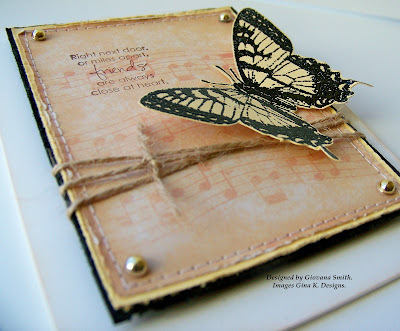 I stamped the sentiment in Espresso Adirondack Ink. Card Stock: White (GP), Pink Pirouette (SU). Ink: Pretty in Pink, Real Red, Espresso. Embellishments: Red Satin Ribbon (Offray), Liquid Pearls. Clear Glitter. 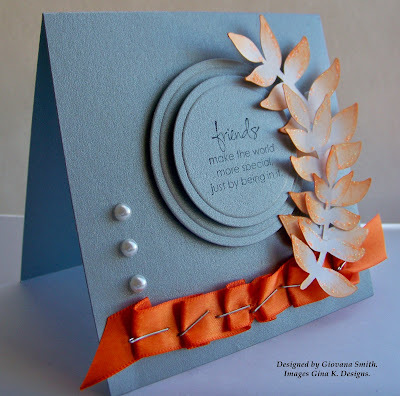 Accessories: Sewing machine, white thread, foam tape, Sunburst Fiskars Border Punch.